Climb the attic and search for that bread-maker, you know it is there somewhere. Once you find it just blow the dust off it right now, as this paleo bread is going to blow your taste buds! A dense, dark loaf perfect for – well, just about any topping. 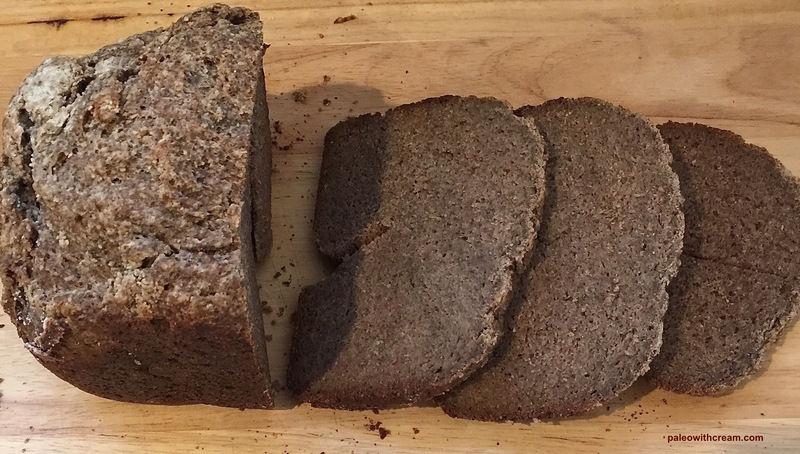 Grain, gluten and dairy free it’s the perfect paleo bread. Most paleo/primally inspired folk will agree that the hardest part of ditching grains is not having bread. I genuinely don’t miss it now – I love eggs over bacon and my tasty lunch salads. But, just once in awhile, bread under scrambled eggs is just what I really, really want. When you walk down the Bread aisle at the store, if you are lucky, you will find right on the last shelf, gluten free bread. Have you read what is in the ingredient list? 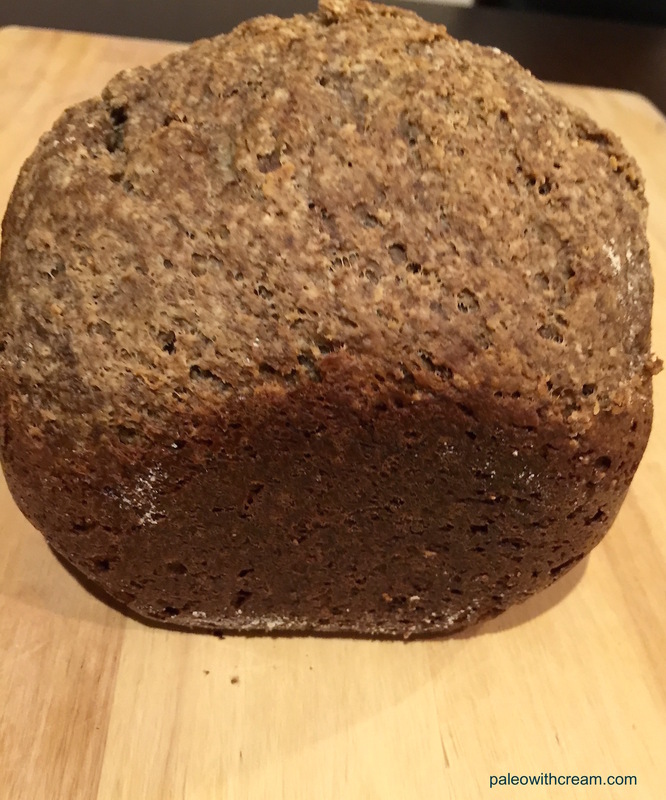 If you are looking for something that is completely paleo – no grain flour with gluten removed, no refined sugar, no rancid, industrialised seed oil, with ingredients you can decipher, then it is a pretty hard call. Whole food and organic shops will stock some reasonably ok paleo bread, but if you are picky like me it is always a compromise. My sister in Christchurch came to the rescue last year and shared her Paleo Bread loaf recipe with me and it has been one of the most viewed posts on the blog. Just as awesome is that is is number eight down the list if you Google paleo bread maker bread! But I digress! What my sister in Christchurch has done now is created another delicious loaf. This time it includes Walnut Flour, I found it in my local organic store and I have substituted LSA for Chia Seed, which is kinder on my tummy. The recipe produces a lovely dark loaf that toasts well and stays moist for a number of days. So give it a try then come back and tell us it works for you. ½ cup Walnut Flour – or Walnut Meal, you can use a food processor to make it finer. 1) Place the first 6 ingredients into a bowl and mix to combine. 2) Scrape the bread batter into the breadmaker. 3) Let this mixture sit for 2 minutes. 5) Set the bread maker for whole wheat bake, smaller loaf, medium crust and wait for the result! Big thanks to my sister in Christchurch, NZ! Looking for softer, fruitier loaves, then try these? Banana and Coconut Bread, Lemon, Honey & Ginger Loaf, Banana and Plum Loaf.